Clean windshields and other hard-to-reach glass surfaces with the Invisible Glass Reach and Tool Gift Pack. It includes Invisible Glass premium glass cleaner, the Reach and Clean Tool and two microfiber glass cleaning bonnets. It has a mesh storage bag to help keep everything organized in your garage or home. The Invisible Glass cleaner polishes glass so well, you will think it is invisible. With its powerful formula, it quickly removes oily dirt, dust, fingerprints, sap, bugs, bird droppings and other difficult grime. The Invisible Glass tool is excellent for cleaning hard-to-reach windshields, windows and mirrors. It combines an ergonomic long reach handle and triangle pivoting cleaning head with two washable, reversible and reusable microfiber bonnets. This tool has a 19&quot; total cleaning length, including the professional handle with foam grip and a pivoting attachable and detachable cleaning head. Clean windshields and other hard-to-reach glass surfaces with the Invisible Glass Reach and Tool Gift Pack. It includes Invisible Glass premium glass cleaner, the Reach and Clean Tool and two microfiber glass cleaning bonnets. It has a mesh storage bag to help keep everything organized in your garage or home. The Invisible Glass cleaner polishes glass so well, you will think it is invisible. With its powerful formula, it quickly removes oily dirt, dust, fingerprints, sap, bugs, bird droppings and other difficult grime. The Invisible Glass tool is excellent for cleaning hard-to-reach windshields, windows and mirrors. It combines an ergonomic long reach handle and triangle pivoting cleaning head with two washable, reversible and reusable microfiber bonnets. This tool has a 19" total cleaning length, including the professional handle with foam grip and a pivoting attachable and detachable cleaning head. No more twisting and contorting, reaching backhand or crawling over seats to clean glass. Now you can reach it and clean it with no streaks or lint. Reach for the Invisible Glass Reach and Clean Tool Gift Pack and clean your windshield or other glass surfaces. Love love love this thing! The people who invented the Invisible Glass Reach & Clean tool must have had me in mind when they designed this awesome tool! As a short female, I have always struggled to clean the inside and outside of the windshield and rear window of my vehicles. I have always felt like I had to be a contortionist in order to accomplish this task. No more, now that this valuable tool has been invented! Just to give you an idea how easy this was for me to use, I was just 6 weeks out of a major back surgery when I tested this easy reach tool, and was still able to easily clean the inside windshield of my Dodge Journey! I could not believe not only how easy it was, but how clean it got my glass, with no streaks, or left over lint. The glass cleaner that is included in this kit is a premium product as well! The set comes with two washable, reversible, microfiber bonnets, along with a mesh storage bag to keep everything in. The one big surprise that I did not expect, is that one end has a hanging loop, but, that end screws off and you can attach any long handle that has the same “screw on” pattern. This wonderful feature enables you to reach windows on your house, camper, or anything else that might have a high window. I wish I had this product a long time ago! I kind of like this because it help me to reach the entire window surface both in and out of the car. I don't have much height or arm length and that has been a big issue for me. I like having clean car windows. This tool helps extend my reach and gets into those tight spaces that I just can get with a normal cleaning. Really helpful when you have a van and can't reach all of the front window. The glass cleaning tool is easy to put together. You just screw the handle together then snap the handle to the head. May take a bit of force to get it to click in. Then you place one of the two bonnets over your triangle head. You just place one of the cloth bonnets one the handle and use the spray lightly on the windows. Use this tool to clean off the spray gathering dust along the way. I find it can be a bit hard to push at times but it does get areas that I have not been able to reach before. A very positive part of this is that it comes with two bonnets and a mesh bag to place the dirty bonnets in for cleaning or keeping your tool with the bonnets together. I always have a hard time getting out and cleaning my house windows from the outside. Mostly because I didn't have a tool like this to assist. I haven't had it for too long, but so far it has worked well. The removable handle it comes with has a screw on end so a compatible rod can be screwed on and assist on the hard to reach areas. I have a painting rod that I bought a few years ago to paint my house and it worked well with it. A little tight fit but it worked. Since I haven't had it too long I do not know how the removable/reusable cloth will be after its first wash, but I believe it will still be in good usable shape. The cloths are easy to remove and reinstall. And they come with a mesh bag for when they are dirty and ready to be thrown in the washer. The aerosol spray can(cleaner) works well and the cleaner does its job as it is supposed to. 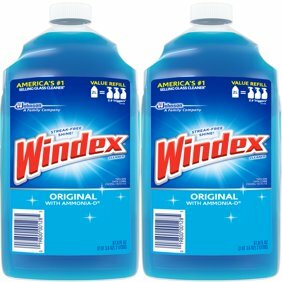 When I run out, I will decide then whether to continue purchasing the same brand spray cleaner or just good ol' windex. Works the same, nothing great and no complaints either with that. The tool is what I valued the most when I selected this product as it will assist me with my house windows and my full size vehicles since I am only 5'8". This product truly answered all of my prayers. I have short arms and I am large breasted. So trying to clean my windshield has always been a tough task. The easy to clean pad is amazing. The cleaning solution is awesome. You will need to use a few coats of it if your windshields are very dirty. A spot clean is one simple spray across. I absolutely love this product for the simplicity and easiness of it. A small child to an elderly person could use this product. Cleaning my windows used to take me about an hour. With the help of this product is now cut that down to 10 minutes. This is a lifesaver and I love it. You also have the option of adding a longer stick to clean the windows on the outside as well. Highly recommend this product for anybody who wants to get in and get out and be done with washing the windows. I already LOVE invisible glass. It gets glass really clean and streak free. And, when I use it on the mirrors in my bathrooms, the steam stays away! This clean tool is very nifty. It has an extended handle and the end of the handle screws off in case you want to use a pole for high places! The microfiber bonnet collects the dirt so it is not smeared back on the glass. You get a very clean, lint free surface. Also, the bonnets are washable using the net bag included in the kit. Overall, I would say this is one fantastic product that helps make short work of window and glass cleaning.